Easiest way to sum it up… it’s what A1 sauce wished it was. 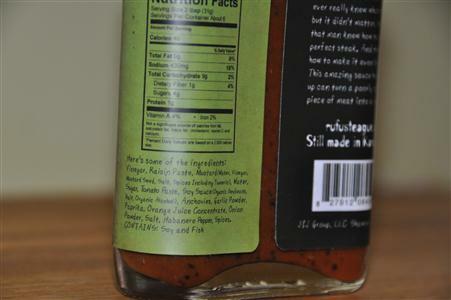 It’s extremely flavorful (similar to A1 but better) and it’s got nothing bad in there for you. 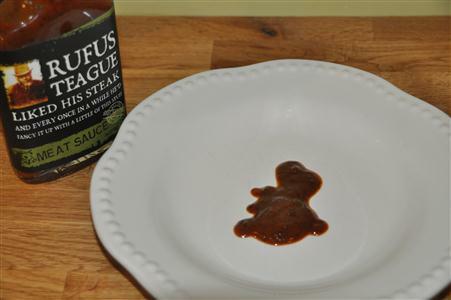 It’s a great sauce, with a solid flavor made by what some might think is an unusual combination – raisins and orange (both are found in A1 Steak Sauce as well). This is great stuff – even Saucy the Dinosaur thinks so (unintentional sauce shape on the plate above). If I had the choice and a limited budget for a sauce to spice up a great steak, I’d go a little bit spicier with the Spicy Meat Sauce, which is a 5 Star Sauce. But for folks who like tasty without the spice, this is the one for you.